The Trek 3500 is an affordable bike yet stands up to Trek’s reputation of having good quality and craftsmanship in their products. Trek offers a Red Shield product Protection Plan for additional warranties. With entry level bikes, the factor that probably matters most is the price/quality relationship, and the Trek 3500 is a deal to go for. Not exactly meant for serious riding, this beginner bike is good for casual and urban rides. Missionaries in urban areas will find good value with the Trek 3500. Trek currently doesn’t offer direct sale from their website. But you can check out their dealer locator page to find out the best Trek 3500 deals in your area. See the rest of our Trek reviews. 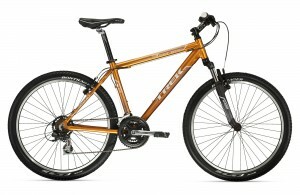 This entry was posted in Mountain Bikes, Trek and tagged LDS mission bikes, Trek 3500 review. Bookmark the permalink.